(Minghui.org) A remarkable thing happened on the streets of Beijing 16 years ago this week. It was the beginning of a monumental chain of events whose significance is still playing out across China today. On April 25, 1999, Falun Gong stood up to be heard. Disturbed by the hardening tone of state-run media, and triggered by the wrongful arrest of dozens of practitioners in nearby Tianjin, thousands went to the capital to seek justice for Falun Gong. It turned out to be the largest peaceful protest in modern Chinese history. They came, 10,000 strong, to resolutely stand up for their beliefs, to stand up for what they believed to be right, and to seek justice for their wrongly jailed fellows. And before that day ended, they got what they came for and peacefully dispersed. Party chief Jiang Zemin and a powerful clique of Party elite had already set the wheels in motion to crush Falun Gong, jealous and fearful of its immense and growing popularity. Government support for Falun Gong, which had earlier been widespread, was no more. Instead, propaganda stories openly criticizing the practice were being published in China’s newspapers and broadcast on national television with greater and greater frequency. On that day, April 25, 1999, the 10,000 gathered in the heart of Beijing to air their concerns to the State Council Appeals Office, which is the usual process Chinese citizens follow to have injustices righted. But that same clique of officials out to crush Falun Gong cleverly instructed traffic police to direct the assembling crowds of demonstrators to encircle Zhongnanhai, the adjacent central government compound, instead. It was a terrific propaganda opportunity. It set the stage for the Party to later accuse Falun Gong of “laying siege” to the government. China’s premier at the time, Zhu Rongji, agreed to meet with Falun Gong representatives. He granted their request to release those wrongfully detained in Tianjin and offered personal reassurances that the government was not against Falun Gong. The 10,000 then picked up after themselves and quietly dispersed, happy in knowing that their requests had been met and their belief that justice would be served. On this day, it was goodness that triumphed. On this day, Falun Gong gave every citizen in China hope, demonstrating that goodness could indeed triumph over the Party that had brought some 90 million of its own citizens to untimely deaths in its 50 years of iron fisted rule. 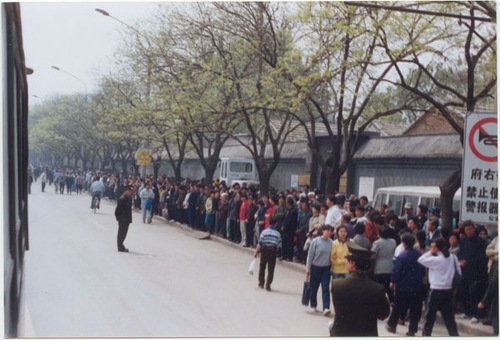 Just three months later, Jiang’s regime launched a state-sanctioned campaign of persecution, intending to wipe out Falun Gong in three months. Yet now, almost 16 years later, Falun Gong and its millions of practitioners remain steadfast and resilient, having met wave after wave of propaganda and violent repression with peaceful resistance. Yes, goodness triumphed on that day back in April 1999. But the Party has used every means at its disposal to try to turn the tide ever since. Countless Falun Gong practitioners have been imprisoned for their beliefs. Tens of thousands have been cruelly tortured. Almost 4,000 confirmed persecution-related deaths have been documented. And a further 40,000 to 60,000 are believed to have been killed for their organs in the illicit, state-sanctioned organ transplant trade. On the 16th anniversary of this historic event, we remember the quiet strength of this peaceful act of resistance, driven by faith and belief in principles, and we ask you to do the same. It is a day well worth remembering.